If it's the best value toner cartridges for HP LaserJet 1200-se laser printers which you would like to get, then the choice is clear. We'll only offer toners that are fully made to work with your laser printer, and that means you don't have to fret about them causing damage. If you prefer LaserJet 1200-se laser supplies which you do not have to get anxious about, shop with Cartridge Save right now! Save lots more money here at Cartridge Save because of our free delivery. Out of the hundreds of purchases posted every single day, a staggering 98% arrived overnight. You can get complete satisfaction if you buy from Cartridge Save courtesy of the extensive thirty day refund policy. Should you have any hassles printing using your HP LaserJet 1200se toner within thirty days after purchase you can easily post it back to get your 100% repayment. Get the best toner cartridges for less with Cartridge Save. Hewlett Packard is a company which have earned their reputation over the years, and this fact should not be overlooked when searching for the perfect printer for your needs. Still, buying a HP LaserJet 1200SE has more benefits than just a recognised brand name and if forward thinking design and effective printing are high on your list of preferences, then the LaserJet 1200SE is certainly worth investigating. 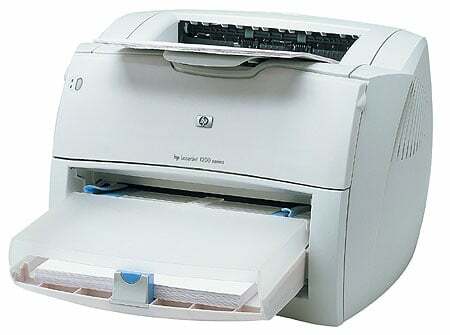 In design terms, the HP 1200SE LaserJet really is very simple. A delightful, curved finish and cream and grey colour scheme make this a stand-out item due to, well, the fact that it doesn't really stand out! If the appearance of a printer is nowhere near as important to you as its performance, then the HP LaserJet 1200SE is definitely the printer for you. The technical advantages of the LaserJet 1200SE are also worth noting. The scanner function is hugely effective and printing results are as impressive as you would expect from a LaserJet printer. After all, with any printer, the most important aspect is the print-outs they produce and the HP LaserJet 1200SE does not disappoint in delivering sharp, well- defined monochrome output. There aren't many disadvantages to the HP LaserJet 1200SE, but the print-out speed is not something which is overly impressive at 15 ppm. Still, as long as you don't mind waiting an extra second or two for extremely impressive printing results, then the HP 1200SE laser printer is certainly an item which you can rely on give you professional quality documents.